How Diamonds Are Graded - The "4 Cs"
Lab grown diamonds are graded with the same standards as mined diamonds, according to the 4 Cs quality factors. "Until the middle of the twentieth century, there was no agreed-upon standard by which diamonds could be judged. 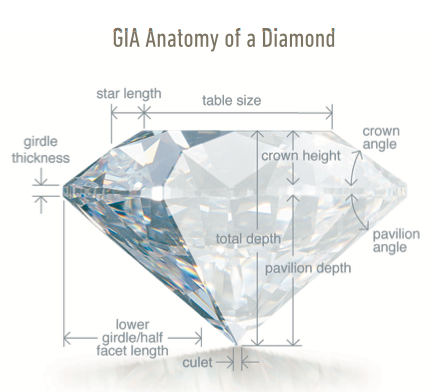 GIA (Gemological Institute of America) created the first, and now globally accepted standard for describing diamonds: Clarity, Color, Cut, and Carat. Today, the 4Cs of Diamond Quality is the universal method for assessing the quality of any diamond, anywhere in the world. The creation of the Diamond 4Cs meant two very important things: diamond quality could be communicated in a universal language, and diamond customers could now know exactly what they were about to purchase." Clarity refers to the presence or absence characteristics in and on the diamond, visible under 10X magnification. Evaluating diamond clarity involves determining the number, size, relief, nature, and position of these characteristics, as well as how these affect the overall appearance of the stone. The higher the clarity grade, the more rare a diamond becomes. It is interesting to note that to the naked eye, there no visual difference in diamonds graded VS or higher, that is why a lot of people consider SI clarity diamonds to be the best value. *Since we believe that a very low clarity diamond can be structurally compromised, Identity Diamonds does not carry the two lowest clarity grades (I2 & I3) in its inventory. N to Z (very light and light color range, lower grade color with an extremely easily detectable color). There is also a range of colored diamonds, which included all shades of blue, yellow, pink, orange, green and red, and is graded on a different color scale called the Fancy Color Scale. Possibly the most important factor in the overall diamond appearance, the Cut refers to the ability of the diamond to transmit light, and therefore sparkle. A diamond's cut grade does not refer to its shape, but rather to how well a diamond's facets interact with light. The main factors in grading cut are proportions, symmetry and polish. A diamond with a perfect color and flawless clarity will only sparkle if it was cut to appropriate standards, while a poor quality cut will make any diamond look dull or “dead”. The "size" of a diamond. A carat is actually a mesure of weight, and one metric carat (1.00ct) weighs 200 milligrams. All else being equal, the price per carat increases when the carat weight increases, because larger diamonds are more rare, hence more valuable.